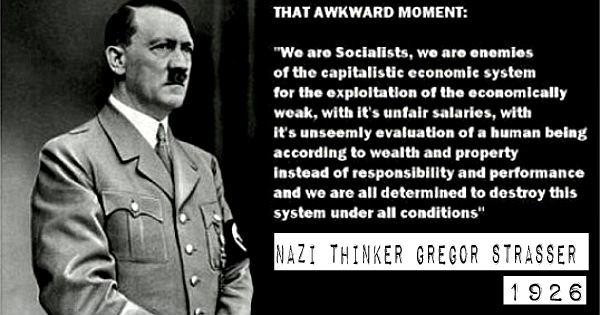 There are two screwy things pushed by leftists of all stripes: Hitler was a right wing person who fought against socialists and communists and we are a democracy. Hitler was head of the National Socialist Party. Never a right wing person. As for fighting against them, Hitler fought against everyone. Trump is nothing like Hitler. The LIE that we are a democracy seems to be accepted by lazy Americans who plain don’t care. We are a republic. Of course the Democrats hate that idea. A presidential candidate in the 1930’s said his own party, the democrats, were socialist. Well, they haven’t gotten any better. All socialists are looney. However, try telling them that. Screwy.